The word “mitzvah” has two meanings in Hebrew. The first one, “commandment”, is the more obvious, since the word comes from the root to command and this root is used in many other words denoting the act of compelling action. The other, as in “do a mitzvah”, meaning “do a good deed”, is more complicated. It has to do with asking for a favor and implying that this favor will be repaid in Heaven, because it is a good deed. In the vernacular Hebrew parlance, this has been taken perhaps too far, as it is not uncommon to hear a husband say to his wife: “do a mitzvah and make me a sandwich”, or something similar. When it comes to miztvot as commandments, far from being only ten, there are 613 of them that cover every aspect of life and upon which there are countless commentaries. There are 248 commandments that call for action and 365 that call to refrain from action. The count dates back to the Amoraim period in third to fifth century AD Judea, or as it was then known Syria-Palaestina, a Roman province that was still being punished for the great Jewish revolts of the first and second centuries. This period marked the growing apart of Rabbinical Judaism and its twin brother from the root of Temple Judaism: Christianity. As Christianity sought to make itself more inclusive by reducing the price of admission such as the number of rules one had to follow, Rabbinical Judaism sought to make itself more exclusive by adding commandments and requiring that all boys spend many years in school attaining a high level of literacy. Much of the theology developed during these early centuries by both religions was a polemic against each other, a running argument of sorts and this argument still underpins much of the New Testament and the Talmud alike. Forgiveness was foundational Christian tenet; the Amoraim, the great rabbis of the age, must have been keenly aware of it. They chose to exclude it from their exhaustive list of what Jews were commanded to do. We are not commanded to forgive our enemies, past or present, personal or communal, now or ever, though on a personal level we may certainly choose to do so. Jair Bolsonaro, the newly elected president of Brazil is a nationalist and an evangelical. Like all visiting heads of state, he was invited, when he visited Israel last week, to tour Yad Va’Shem, Israel’s Holocaust memorial and the premier Holocaust study institution. 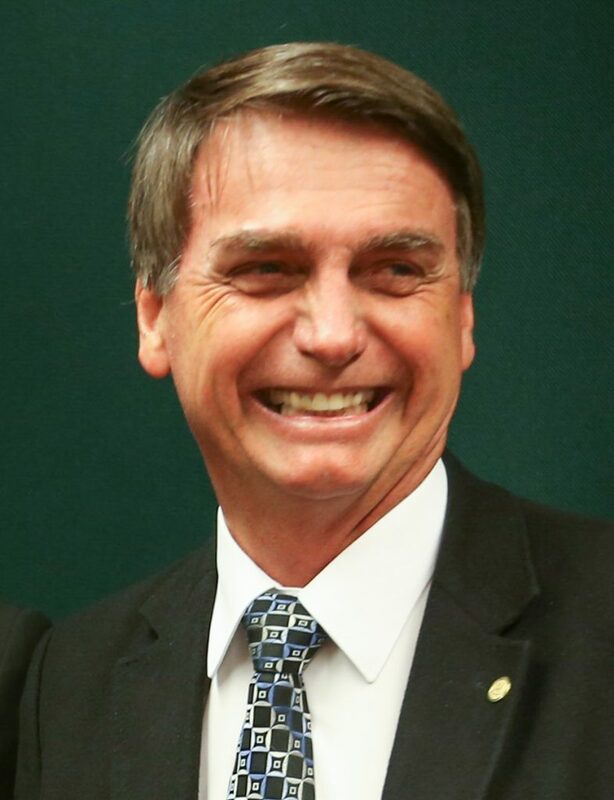 Bolsonaro, like Trump, is not necessarily “presidential” and while still in Israel he expressed the opinion that the Nazis were “undoubtedly socialist”. For this he was roundly criticized by the usual chorus of Israeli progressives, though of course, he was right. German National Socialism, European Democratic Socialism, Canadian Progressive Conservatism, and all the other “isms” preceded by the modifier, are not defined by their modifiers, but rather by their substance. Socialism was a reaction to the mass wealth increase and wide distribution of wealth brought about by the mid-19th century industrial revolution. Where before wealth was concentrated only among the nobility and really only among the upper echelons thereof, the newly emerged entrepreneurial opportunities created by the steam engine technology increased the number of rich people by orders of magnitude. The industrial revolution also brought many peasants into the cities and created from what was once a highly distributed population a concentrated and potent political force, ripe for exploitation by unscrupulous politicians. These politicians made the same exact empty promise to the masses back then that they are making now: give us the political power to confiscate wealth from the “owner class” and we will make sure that you will want for nothing, that everything will be provided to you free of charge. And thus the Big State was born. With the birth of socialist statism came its modifiers. In Russia, it was Soviet socialism, supposedly, but of course not really, giving power to local councils or “soviets”. This was a pan-global socialism, one that thought of nationalism as a marker and an attribute of the dreaded bourgeoisie. The German national socialism was a reaction to the soviet one, claiming that national origins were determinative of a people’s destiny and gave it certain rights, such as the subjugation and annihilation of other peoples. But the statist nature of socialism remained unchanged. From Nazi Germany to the Soviet Union, from China to the EU, the one common underpinning is paramount: it is the State and only the State that matters. So Bolsonaro was right and brave to point out, in Yad Va’Shem of all places, that the Nazi movement was first and foremost a socialist movement. He was particularly right to do so at Yad Va’Shem because only countries that are statist, countries in which the State holds all the power, are capable of atrocities the likes of those committed by the Nazis, the Soviets, and the Chinese. Japan was not socialist, but it was statist, an oligarchical monarchy. Colonial European powers committed plenty of despicable acts in their colonies from Algeria and Mozambique to Indochina, but they were moderated by their need to heed their own public opinion and thus never rose to what was done by the statist socialist regimes. Arriving back home and speaking to a supportive evangelical audience, Bolsonaro opined that the Holocaust can be forgiven, though never forgotten. This immediately drew sharp rebukes from Yad Va’Shem and Israeli president (an honorary title in Israel), Ruvi Rivlin. PM Netanyahu, who brokered the warm relationship with Bolsonaro and together with President Trump welcomed him to the club of nationalist leaders, remained silent, but sent his ambassador to Brazil to issue a conciliatory statement defending the Brazilian president. Today, Bolsonaro himself released a statement that forgiveness was a personal matter and he certainly did not intend to suggest that Germany’s role in the Holocaust should be communally forgiven. He also, supposedly independently, promised that Brazil, from now on, would vote with Israel in the UN’s human rights council, an infamous hotbed of anti-Zionism and anti-Semitism. This riff, inconsequential as it may seem, is interesting, because it tells us something about the lingering difference when it comes to the issue of forgiveness between the Christian and the Jewish consciousness and because it sheds light on the highly conflicted Jewish and Israeli communal understanding of the Holocaust and how to deal with it and its consequences. In the 1960’s, only two decades after the Nazi regime fell and the few survivors staggered out of the German death camps, Israel, then led by David Ben Gurion, made a deal with Germany in which the two countries established diplomatic relations and Germany agreed to pay Israel and many direct Holocaust survivors very significant reparations. The deal was not universally welcomed in Israel, to say the least. Future prime minister Menachem Begin, then in opposition, led a highly emotionally charged protest against it in the Knesset. Today, the deal is universally accepted. And yet… Israeli government eschews buying German made automobiles for its functionaries in civil or military service. There is something unthinkable about an Israeli official driving a Mercedes Benz or a BMW, or a Volkswagen, all marks that were widely used in Nazi Germany. That being said, many thousands of Israelis who can afford these cars can freely buy them and enjoy driving them on Israeli roads. Soon it will be Holocaust Memorial day in Israel. Thousands of people will stop their German-made cars and get out so they can stand at attention while the sirens wail. The memory of the Holocaust is as fresh today as it ever was with us. I for one am glad that my faith does not command me to forgive, because there is no way I could find total forgiveness in my heart for those Germans who lived then, for those who live now, or those who are yet to be born. I always enjoy your well researched & thought out articles. I agree 95+% of the time! I always learn from them, even though i do not agree 100%. Your very well thought about Socialism & all that entails is right on. Imo, the only place that socialism worked out well in the short run, was in Israel kibbutz outlook during Independence & the struggle to survive post holocaust. It is not translatable across multi-generations. Israel, now encourages individual efforts & Israel has blossomed economically & technically. Bravo! Per writing, i need numbered boundaries for specific points. 1. I am 100% in support of Israel: past, present, & future. Imo, President Bolsonaro agrees with me. We are both Evangelical Christians and support Israel’s right to exist & to thrive. 2. I do agree that Bolsonaro stepped in it, per comments about Christian forgiveness when speaking about the Nazi holocaust inflicted mainly on Jews during WW2. Imo, i agree with you that he was not minimizing the revolting murder & general treatment of innocent hard working European Jews, but looked at it from Christian perspective, which heals individually per forgiveness -we forgive because of Jesus, our own granting of forgiveness, even though we were never worthy. Jews were always at the top of the Nazi extermination list, but other minorities were a close second. Christians were also to be targeted after the cessation of WW2 hostilities, because they clung to Jesus & not the Nazi new religion of Aryan myth superiority combined with a few trappings of Christianity. 3. You rightly point out again, that Judaism & Christianity have solid roots together roughly 2000 years ago. The biggest problem for Christianity was not a few hundred years of Roman persecution in which many were murdered, but a later unholy marriage of State & Church. The beliefs & practices of the Church were frequently compromised by Statist leaders for their own purposes. Jews were convenient targets of the Church-State period, even though there is Nothing in the New Testament (obviously not Old Testament too) that would support persecution & murder of Anyone, including Jews. Btw, later in my obviously sheltered life, l heard comments that Jews were Christ killers. It was abhorrent to me. If you believe that, then IMO you are not a Christian at all. True Christians realize their many failings/sins are only redeemed by Jesus’ total sacrifice & subsequent grace in our lives. Since we have been so forgiven much, how can we not attempt to forgive others in our lives. Trust me that is tough, since if family members were murdered, my natural response would be to inflict that & more on those responsible. 4. Imo, sadly Jews have been the most persecuted people & religion group in history. When Jews have had more freedom they prospered; which imo was part of a long anti-Jewish lead up of Nazi (National Socialism xyz) Germany. Our God’s promises to Abraham, Isaac & Jacob (Israel) stand today. Imo, this Jewish persecution speaks to our God’s eternal Biblical promises & an ongoing spiritual War that He has allowed to exist for a season & purpose. I do not understand all that, but i am willing to trust the God of the Bible, who i believe is My Savior & One with Jesus. 5. Although i attended an Ivy League school (technical field – your entropy reference makes me smile), i can see that you have a much greater breadth of understanding in many areas. That said, i have interacted with Jews frequently, including having dinner & watching their homes for extended periods, while single. I faithfully maintained their Kosher kitchen while watching their home, but it constantly made me nervous. Even though i did not accept this Kosher law myself, i determined that i would uphold it while in their home. I later asked about why the separate dishes/silverware for milk & meat. I was told it was in reference of not following pagan practices & boiling the kid in her mother’s milk (Exodus 23:19). I obviously looked like a confused gentile. It was then explained to me that erecting extra legal barriers outside of prescribed Old Testament law would help never getting close to actually breaking Old Testament law. Even Old Testament law (with/without the Talmud) convicts each of us before Our Almighty God. If not what is the purpose of Passover & Yom Kippur? 6. Your reference to a Rules level distinction between Judaism & Christianity (particularly that Christianity has an easier path – per less rules) should be discussed. NT Christian thought is that even if we think about violently evening a score or hate someone – we are guilty of murder. Even if we lust, we are guilty of adultery. Even if we envy, we are guilty of thievery & also wider idolatry. Our own mind will always convict us before a Holy & All Knowing God. So which is the easier path? 7. I am 100% behind Israel and a Jewish states’ existence. The level of actual & implied violence towards a Jewish people in a small sliver of land makes Zero logical sense, except to be part of our God’s greater plan for His Chosen people. I pray for Mercy & Justice….who can do that perfectly, except our God. Thank you for your well-thought out comment. I would say that contrary to common perception, kibbutzim were more Spartan than socialist. It was a way for Israel to raise a generation of military and civilian leaders who were tough as nails and unencumbered by family considerations or the need to make money. Forgiveness is coded in Jewish law. –RAMBAM (Maimonides) Mishneh Torah, Laws of Repentance, 2:10. It is a recommendation, a piece of advice, not a commandment. Should, not shall. Thank you for your comment. You know, it’s funny. I’ve studied the Koran. I understand the danger it potentially presents. Yet all my life I’ve been a major supporter of Israel and Jews in general and basically knew almost next to nothing about Judaism itself. This article has made me realise what a mistake it was to support something without knowing more about it. I think its about time I took a little closer look at Judaism and what I’m so adamant on supporting. I have a feeling, if your comments on forgiveness are accurate, I’m not going to be very pleased about what I uncover. Thank you. I think people in America tend to underestimate the deep chasm between Christianity and Judaism while overestimating the similarities. It is also true that American Jews tend to practice a kind of assimilated and heavily influenced by Christianity version of Judaism, but its a perversion. As you say, knowledge is always good.